Good shout mate, just snagged that. It's annoyed me that noone's picked either of these up yet. Italian as you like. Gutted neither would fit me, I would happily had them both if they did. John Stephen's cufflink set for 15 quid last year. Get in! Very nice Smiler, very nice. Some finds im too big to fit into so other people can buy....a waste for the uninformed to buy accidently Generally annoys me it isnt bought. Not really a bargain, but one of the more nicer knits ive seen in a long time. size 42. Makes me want stop going gym. Lot of two polo shirts, Would do as a wardrobe filler for summer, cant argue for the price. Saville row shirts, Tab collar and Pin collar for 20 quid each in plain white all sizes. Ive been told they come up BIG though, so maybe one for the ones with big necks small bodies (or get it darted to hell etc). Cant argue for price again though. Cheers, things like that don't happen too often mate! Would have paid that for the box alone. 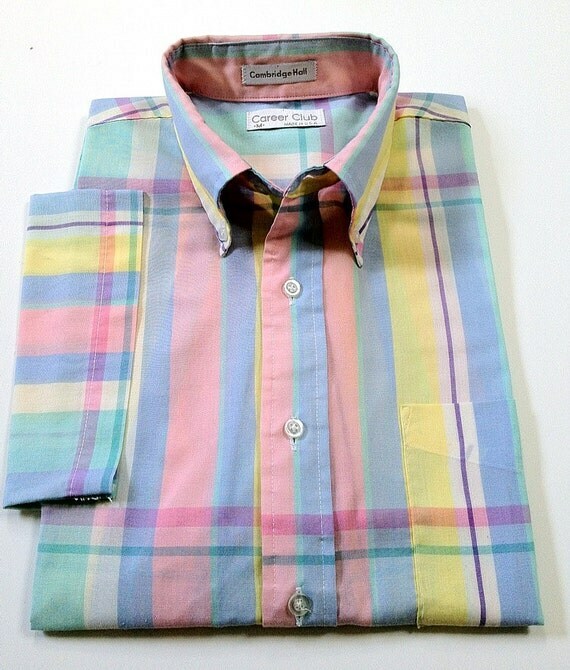 Lovely S/S madras button down on Esty.